The second day in our 3-part series focuses on day-to-day challenges facing compliance professionals. 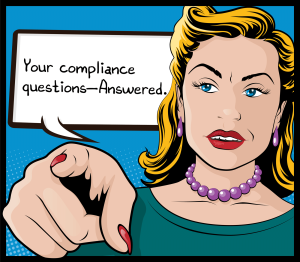 How can senior management encourage employees to come forward with compliance concerns? How can the CEO help a compliance and ethics program? A. Appoint a senior compliance and ethics officer that has both the soft skills and the tactical knowledge to be able to succeed. B. Empower the senior compliance and ethics officer with an appropriate budget and reporting responsibility to the Audit Committee of the Board of Directors. C. Include the senior compliance and ethics officer in meetings of the executive team and ensure that his/her input is solicited and heeded. D. Encourage investigative processes that are necessary to create a foundation for the program; and support the discipline recommended by an empowered compliance and ethics committee. Tone from the Top, or Tone from the Middle? What is the greatest misperception about compliance?